Every year... right around this time... I know that you all do something that I've been doing this week. I'm going through the girls drawers to pull out the warm weather clothing... and I'm going through my storage bins to see what might still fit before I head out to shop. As always... it was wishful thinking that Zoe and Ana would be able to wear what they were wearing last March and April. If I'm lucky... Ana will be able to wear some of Zoe's hand-me-downs. (Will be able to... and also will be willing to.) I always end up with a pretty big bag of clothes to pass on and/or donate. I'm positive you do too! This year... before dropping those closes in the general donation bins... think about pulling out any jeans and coats!!! Volunteers with Madison's United Methodist Church have made it so simple for you to pass on your jeans and coats to those who could really use them. These items will be used for Sole Hope and the Market Street Mission. Used denim jeans in any condition are being collected by The United Methodist Church in Madison though Oct. 21. 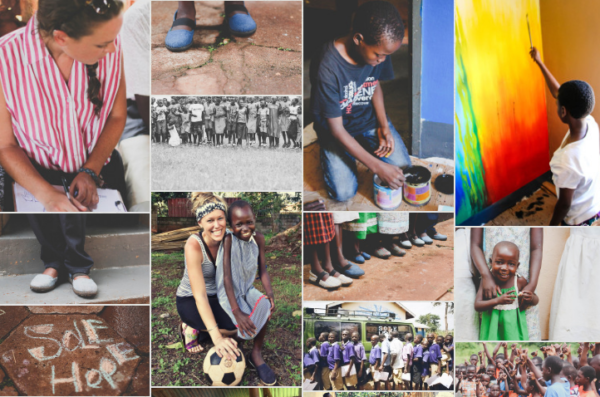 Volunteers will cut denim jeans into pieces to form the fabric upper portion of a simple slip-on shoe for children in Uganda through a project with the non-profit Sole Hope. Without shoes, youngsters often contract a painful infection from jiggers, a maggot-like sand flea, which can cripple and even kill a child. The only way to remove jiggers is with a sharp pin, often with no anesthesia, according to Sole Hope’s founder Asher Collie. Gently used coats in all sizes are being collected at the church through Oct. 23. They will be given away at Market Street Mission’s 26th annual coat giveaway on Morristown Green on Saturday, Nov. 5. For more information or to register for the shoe cutting party on Oct. 23, email church@umc.org, call 973-377-1231, or via Facebook. Volunteers are also needed to sort donated coats at our Thrift Store and help on the day of the Coat Giveaway. For more information on volunteering, please call 973-538-6337. Look Great For Back To School Drop-Off and Pick-Up!